BHU UET 2019 is an undergraduate entrance exam for admission in Banaras Hindu University. BHU application process has started from 10 February 2019 and the entrance exams will be held from April - June on different dates for different courses. 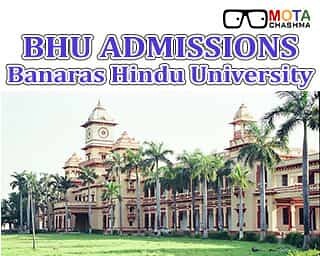 BHU Admission 2019 in the UG courses is based on entrance exam known as BHU UET which is conducted by Banaras Hindu University. BHU Admission 2019 will be done by the Admission Committees of the respective departments after evaluating the results of the respective UET Exams. The application form for BHU UET and PET are available on the official website bhuonline.in and also on the link, given below this page. The courses offered by BHU are divided into General Courses, Professional Courses, and Vocational Courses. All the courses are conducted in different faculties of BHU, and some courses are conducted in the following institutes/ colleges affiliated to BHU. The Individual Course links provide complete details about the particular Course. These Courses have been divided into “General Courses” and “Professional Courses” and will offer admission based on BHU UET 2019. 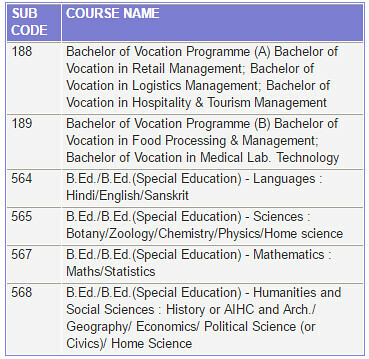 BHU offers many vocational courses and these courses are 3 years duration course, The name of these courses are as follows. The candidates have to appear in BHU UET for admission to these courses. For BA (H) Economics the candidate must have Mathematics as one of the subjects in Class 12.
any other equivalent examination recognized by the University securing at least 50% marks in aggregate. However, in case the candidate makes the application (fills up application form) for more than one course under UET 2019, the Application Processing Fee /Entrance Test Fee payable by him/her for each subsequent application (after first application) shall be Rs. 200 and Rs. 100 for SC/ST. The application fee can be paid online or through HDGC Bank Challan. BHU UET 2019 exam will be held in April and May. BHU UET exam dates (course wise) is given in the link below. The exam will be conducted in 2 meetings/shifts slot for UET and in 3 Shifts for PET. There shall be negative marking in BHU UET for all Courses of study in UET. Three marks shall be awarded for each correct answer while one mark shall be deducted for each incorrect answer. The unattempted question will be awarded zero marks. Each exam will have a different exam pattern and students can check them on the courses link given above. The student has to mark the answers on the OMR sheet provided at the test centre with a black/blue ball point pen and there will be no provision to re-evaluate the answer sheets. BHU Admit card will be available 10 days prior to the BHU UET 2019 Exam. Students have to log in on www.bhuonline.in to download BHU Admit card. It is a very important document and students should make sure to get it on the day of the exam as without the admit they would not be allowed to write the exam. Relevant details: The candidate should check the name, photograph, signature, the address of the test centre allotted and test date & time on the downloaded BHU Admit Card. Paste photo on Admit card: A passport size photograph has to be affixed (same passport size photograph which has been used for BHU UET 2019 Application Form) in the space provided on the printout of the Admit Card under self-attestation. The students should keep the admit card safely with them till the admission process gets over. Get complete details on BHU UET Admit Card 2019 by following the link below. BHU UET Result will be released by Banaras Hindu University for various courses, Candidates can check the results of the UET Entrance Exam on the link below. BHU UET 2019 Information brochure has been released by the Banaras Hindu University. The information brochure is given on this page which provides complete details regarding the application form, course. fee structure, exam pattern, admit card and result. The Banaras Hindu University was founded by Pandit Madan Mohan Malaviya in 1916. BHU Varanasi is the most prestigious Central University in the country. As per the several surveys, every year around 20000 students takes admission in BHU University which makes it as one of the largest residential universities in Asia. BHU is organised into 4 institutes and 14 faculties (streams) and more than 140 departments. Several of its colleges, like IIT-BHU, science, linguistics, journalism & mass communication, performing arts, law, agriculture (IAS-BHU), medicine (IMS-BHU) and Institute of Environment And Sustainable Development (IESD-BHU), are ranked among the best in India. BHU IIT admission is based on JEE Advanced and BHU IMS admission is based on NEET UG Exam. 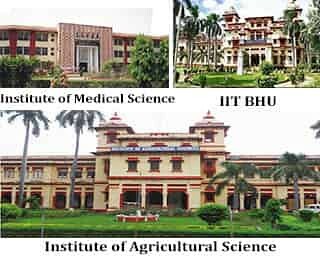 BHU Institute of Agriculture Science provides admission on the basis of BHU UET for Undergraduate Courses and BHU PET for post-Graduate Courses. If you have any query related to BHU Admission you can write in the comments section below.